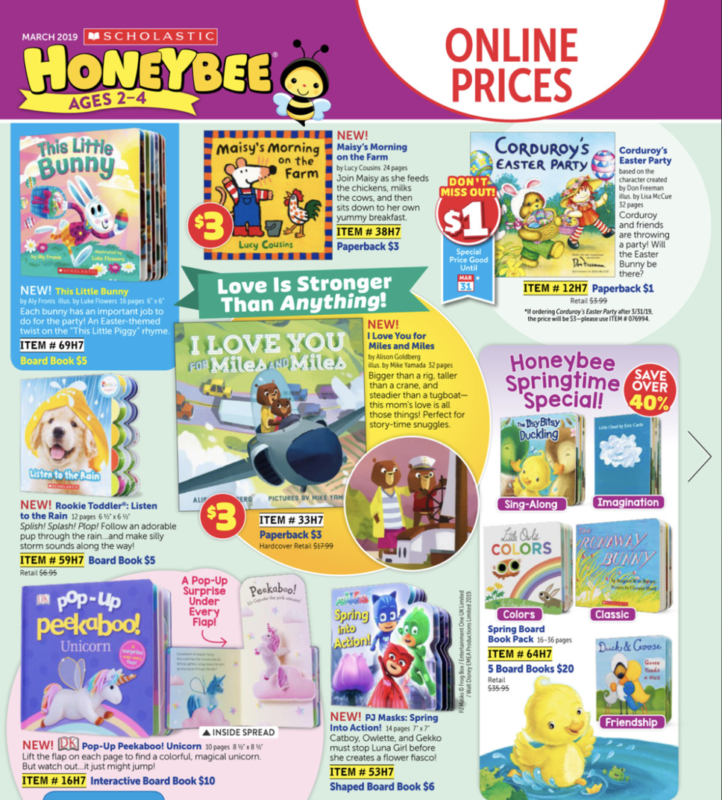 I Love You for Miles and Miles is featured in the March 2019 Scholastic Book Clubs Honeybee Flyer. Look for this new paperback edition at book fairs! 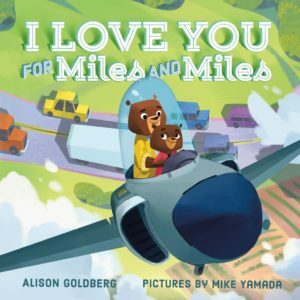 The board book edition of I Love You for Miles and Miles releases on 12/31/18! 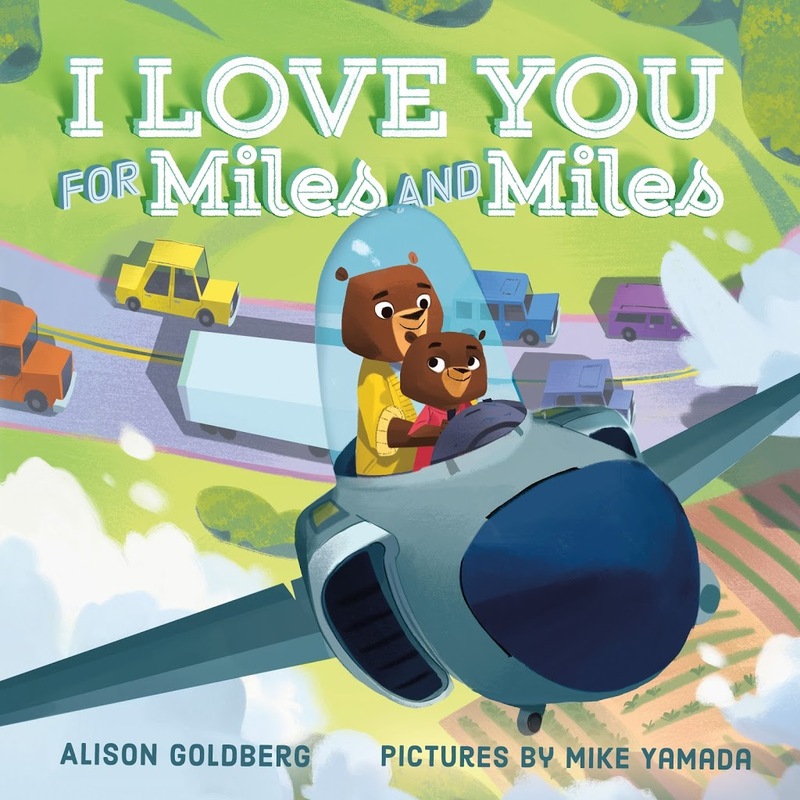 The board book edition of I Love You for Miles and Miles, illustrated by Mike Yamada, releases from Farrar, Straus and Giroux on 12/31/18! My book’s adorable new little sibling! For signed and personalized copies, visit my wonderful local indie, Porter Square Books (they will ship). 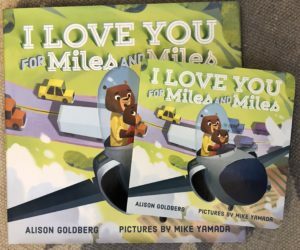 Just like with the hardcover, a portion of book proceeds from I Love You for Miles and Miles will support the Campaign to End Childhood Hunger (led by the Food Research and Action Center). To celebrate the board book’s upcoming release, I’m hosting a few giveaways. 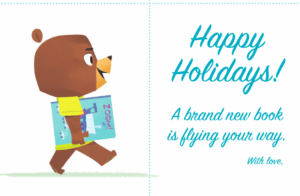 First up is a giveaway on Twitter, including a copy of the board book + swag + this adorable bear card. Visit me on Twitter before 12/27/18 for information about how to enter. 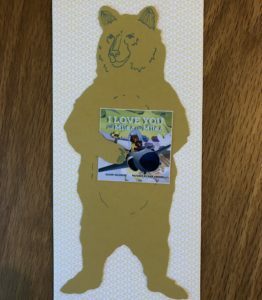 I picked up this bear card at another favorite bookstore, Whitelam Books in Reading, MA. Watch for additional giveaways during the next few weeks. 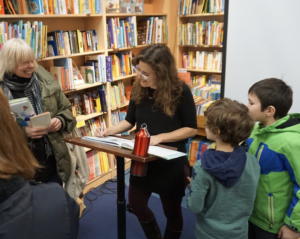 I have several events lined up in 2019, including storytimes at Porter Square Books in Cambridge, MA, The Silver Unicorn in Acton, MA, Barnes & Noble in Framingham, MA, and Barnes & Noble in Hingham, MA. Check my events calendar for details. I am thrilled to share the announcement for my next picture book! 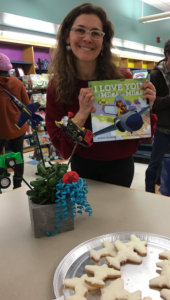 My new picture book, I Love You for Miles and Miles, released on 12/26/17. Look, there it is on the shelf! Bigger than the biggest truck-sized thank yous go to fabulous editor Janine O’Malley, rockstar agent Kathleen Rushall, and the very talented illustrator Mike Yamada! I launched the book at my amazing local indie, Porter Square Books. 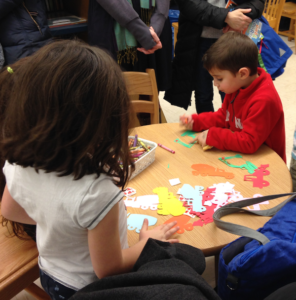 My second event was hosted by the wonderful O’Neill Branch of the Cambridge Public Library. and posed for pictures with the book cover. I’m grateful to family members, friends, writers, and kids for celebrating with me! I have several other events coming up in MA and NJ, including some where I’m teaming up with stellar picture book authors and illustrators. I hope you’ll join me if you’re nearby! Thanks also to many generous writers who have reviewed this book and helped send it out into the world. 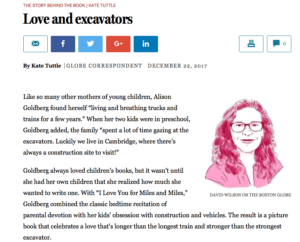 I Love You for Miles and Miles is a Notable New Picture Book on the Barnes & Noble Kids blog, an Amazon editors’ pick, and was featured in The Story Behind the Book column in The Boston Globe! 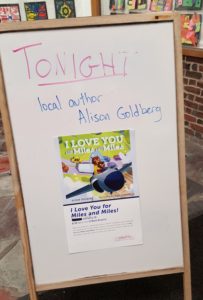 Some other highlights from this past month include the little girl who at my first reading raised her hand and asked me to read it again, the grandmother who had me sign copies for all of her grandchildren, and the pictures friends have shared of their kids with I Love You for Miles and Miles. 2 weeks to pub date! My new picture book, I LOVE YOU FOR MILES AND MILES, illustrated by Mike Yamada, releases from Farrar, Straus and Giroux on 12/26/17! Right now you can enter to win a copy on Vivian Kirkfield’s blog or through the Goodreads giveaway. You can preorder I LOVE YOU FOR MILES AND MILES where books are sold. Signed copies are available through my wonderful local bookstore, Porter Square Books, and I’ll also include a bookmark, bookplate, and sticker. Would you like to send I LOVE YOU FOR MILES AND MILES as a holiday gift? Though the book releases on 12/26/17, you can place a preorder and give your recipient the matching holiday card to let them know the book is on its way! In an interview with Vivian Kirkfield I discuss childhood fan art, writing books of the heart, and why sometimes French Toast can be a good dinner option for writers. 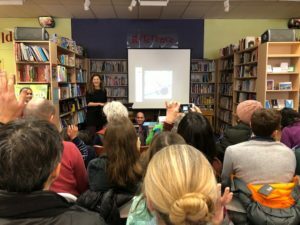 Jess Keating included me in her wonderful classroom ezine, The Curious Creative, where I talk about humpback whales, flashlights, and my love of rock climbing. 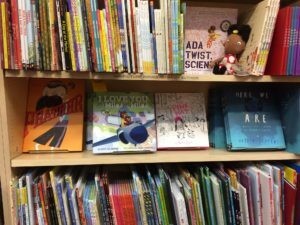 More interviews are coming soon, including blog tour stops at Kidlit 411, Tucson Tales, Picture the Books, Celebrate Picture Books, and Karlin Gray’s blog. Thank you to all of these generous writers for including me in your posts! 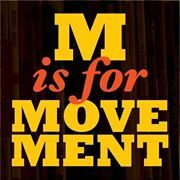 I’m excited to announce the launch of M is for Movement , a new blog focused on activism and social justice in children’s literature! I’ve been collaborating with an amazing team to get this up and running. You can read more about our mission here . 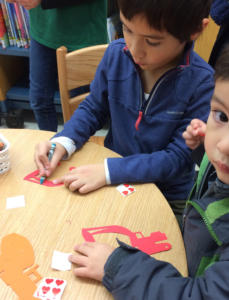 On the site you’ll find interviews with picture book creators Daniel Camacho , Cynthia Levinson , and Innosanto Nagara , and a post by middle grade author Supriya Kelkar . You can subscribe to receive updates, or follow the blog on Facebook or Twitter. Please get in touch if you have post ideas or would like to learn more. 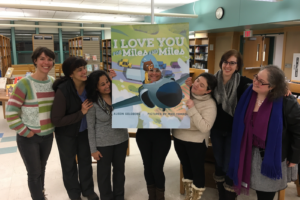 My first picture book, I Love You for Miles and Miles, illustrated by Mike Yamada, is scheduled to release from Farrar, Straus and Giroux on December 26, 2017. Take a look at the publisher’s site for a sneak peek! The book is available for pre-order where books are sold. To celebrate the cover reveal, Hayley Barrett (author and critique partner extraordinaire) interviewed me on Books in the Meadow, where I discuss the inspiration for this book. 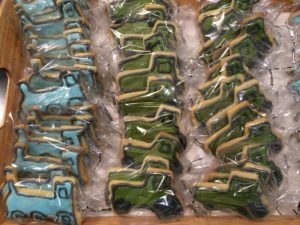 I shared my road-to-publication journey with Carol Gordon Ekster (author of the soon-to-be-released picture book, You Know What?) on Writers’ Rumpus, where I’m also doing a book giveaway this week. 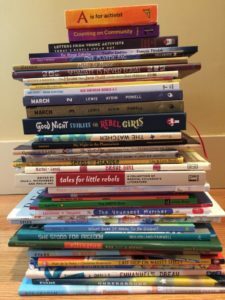 So many wonderful 2017 picture books! During the past few months, I’ve sought out other authors and illustrators with books releasing this year. 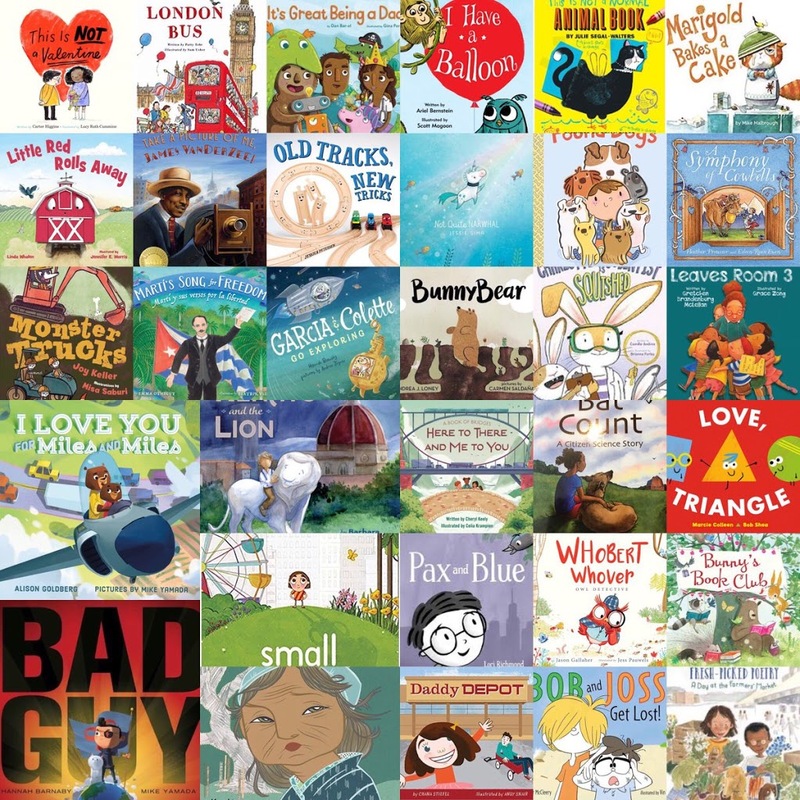 I’ve connected with many talented picture book creators and I’m excited to cheer on their books! 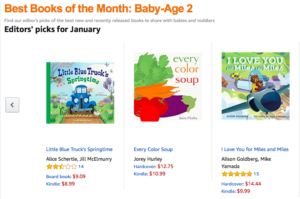 Visit Picture the Books to learn about 2017 picture book debuts. On the site you’ll find a variety of titles, as well as an interview series with new voices in children’s literature. And here’s a Goodreads list with additional 2017 picture books. There are so many books to love this year! I began this blog a few years ago in order to reflect on activism and social justice in children’s literature. Writing projects pushed blogging to the back burner for a while but these topics are still very much on my mind. 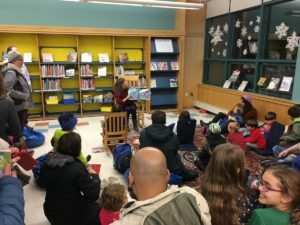 Last month, I had the opportunity to participate in a community organizing event in Boston, where my daughter and I brought a stack of books to Radical Kids’ Storytime. It gave us a chance to go through our shelves, reread some favorites, and connect with kids through these powerful stories. These days when I take my own children to protests, I think about how important activist picture books are. These stories help prepare us for events, put our actions into context, teach history, inspire us, and start discussions. 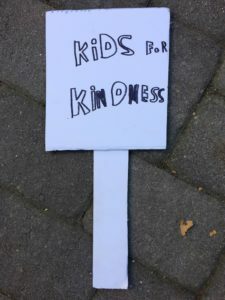 I’m starting up this blog again, to discuss books that introduce young children to a variety of forms of protest. Some great book lists are available on this topic: Carter Higgins’ post on All the Wonders, 35 Picture Books for Young Activists, the recent Washington Post article, The best books for raising activist kids, and the wonderful blog, The Pirate Tree. Let me know your favorites! I welcome recommended titles for the blog. More soon… Thanks for reading! I spoke with Innosanto Nagara in 2013 when A is for Activist first hit the shelves. Inno brought this debut picture book into the world through a successful crowdfunding campaign, which then led to publication with Seven Stories Press in English and Spanish, as well as the recent release of a Swedish edition. I’m always pleased when I walk into the children’s section of a bookstore and see the familiar cover. With 50,000 copies now in print, A is for Activist continues to shine. 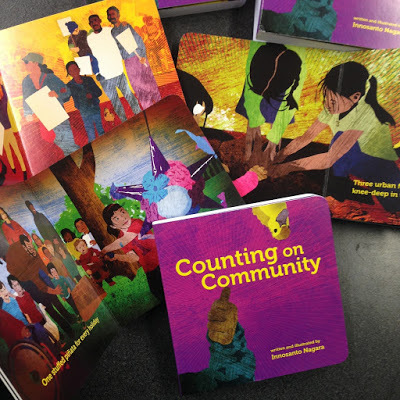 So I was thrilled to catch up with Inno this week about his brand new children’s board book, Counting on Community (Seven Stories Press, 2015). It is a wonderful complement to his debut. Again, Inno skillfully couples rhythmic picture book phrasing—”Five chunks of chalk on the sidewalk”—with bright illustrations that invite readers in to participate and play. 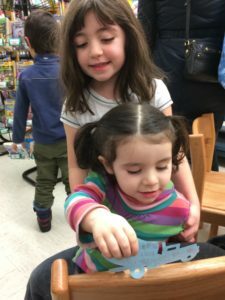 This time, through the familiar structure of a counting book, readers learn about what it can mean to live in a cooperative and diverse community. Counting on Community is the perfect addition to a childhood activism library. The way you express “community” on these pages feels very specific and personal. For example, right on the “one” page, a whole crowd reacts to a piñata (“One stuffed piñata for every holiday”) but each person has a unique gesture or expression. Can you talk about the community you’ve illustrated in this book? This is an image that started with a photo of my son’s birthday party in the yard of our co-housing community. Many of our friends will recognize their kids in the image, and the varied expressions are basically what was captured in the photo. But I did add some additional “characters” for composition and balance. No single image can capture the possibilities of what “community” can look like in a literal sense. But community is about people coming together, so I wanted to lead with an image that represented that concept. Later I illustrate how it can also be about alone time (with chalk on the sidewalk, for instance), the stuff we share, the activities we do together, and the values we live. But most importantly it’s about people in our diversity. I love the concreteness of “Seven bikes and scooters and helmets to share” with a pile of gear just waiting to be used. This value of living in community is so relatable for a child! And then I think you take such an interesting turn. To go from the pile of gear to “Eight picket signs showing that we care” is so powerful. You’ve handed everyone a picket sign in the illustration, as if the picket signs, too, had come out of a shared pile. Did you think about the relationship between these pages? Sharing is a big theme for me. I can’t stand how “the sharing economy” has been coopted by private companies that use their apps to undermine community set standards around environmental, safety, and working conditions. Sharing is about not everyone having to own their own everything. 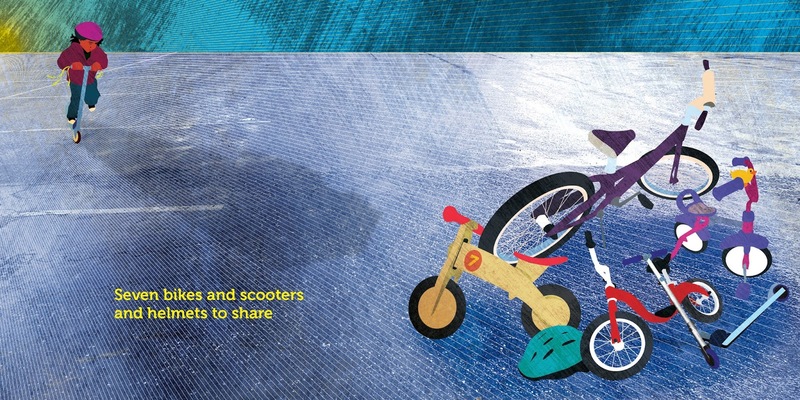 Sharing is about our kids developing core emotional skills and empathy. Sharing is about reducing waste. Sharing is about all of us or none—solidarity. I didn’t grow up in this country, but one of the biggest challenges I’ve had with raising my child in the U.S. has been trying to do this against the tide of individualist messages we are bombarded with. We are lucky to live in community ourselves, and he will grow up knowing that his experience was made possible by the fact that we’ve been able to do it together with others. But you’re right, the idea is that there is a common thread between the idea of sharing our stuff and taking action to ensure access for all. You chose to leave the picket signs blank. Can you talk about that? Originally I had thought of putting in timeless slogans representing progressive values. “My Body My Choice”, “Black Lives Matter”, “Food Not Bombs”, etc. But that didn’t work because it would mean reducing the fight for social justice to eight slogans. My previous book, A is for Activist, was where I got to share 26 visions of the movement. Counting on Community is not a counting version of A is for Activist. Where A is for Activist was about the issues, Counting on Community is about how we live. 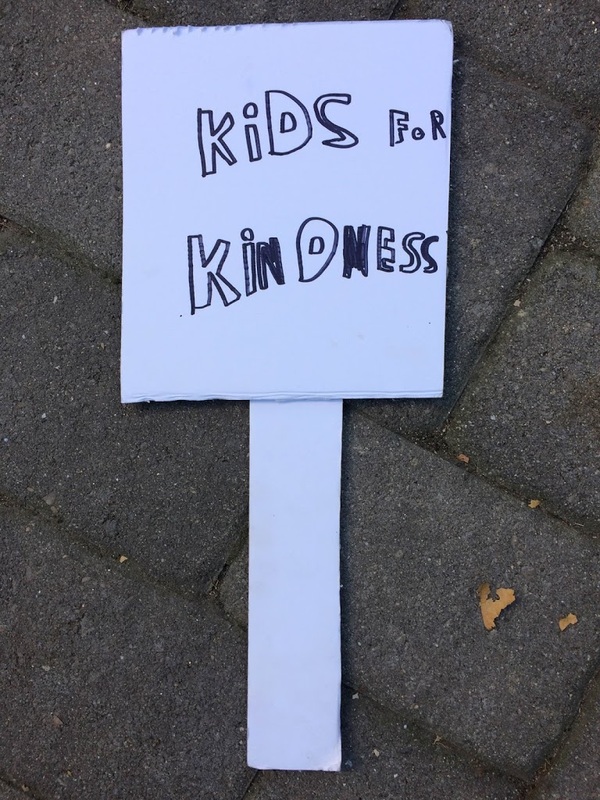 So I decided to leave the picket signs blank and encourage each family to fill them in with the messages they come up with themselves. Like your text, your artwork is so layered. How do you construct your illustrations? Thank you. I love the word “layered” because it’s the best way to describe what I’m trying to do. 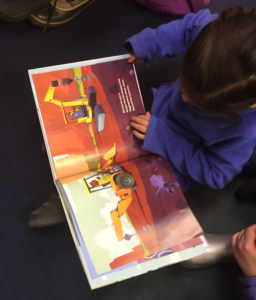 The layers in the text are important because these books need to be interesting to both the children and the adults who read with them. I want the adult to be able to read the book over and over without getting bored and I want the children to be able to find new understandings as they re-read and revisit them at different developmental stages. Bored adults can’t convey a love of reading. Flat images that leave nothing for a child to discover tomorrow end up gathering dust on the shelf. But to your question on technique, I usually start my illustrations with a sketch or a photo that I hand-trace in a vector illustration program. This allows me the crisp outlines and the ability to work and rework it until I get everything exactly how I want it. Then I take it into a photo editing program, where I literally place each element into it’s own layer. Then I place scans of textures and colors into overlaying layers. Then I add in lighting and shading layers. So literally, the illustrations are created in overlapping layers. I spend days trying to get the balance of composition, text, depth and lighting just right through adjusting these elements in each layer for each image. On the final page, your play on the word “counting” is lovely (“So what can you count in your community? I can count on you, and you can count on me!”). It’s simple and goes to the heart of the book. Did you start with this idea or did it come about through the writing process? That was always the core concept. After the success of A is for Activist, people asked me what I was doing next, and for the longest time my answer was, I don’t know, maybe nothing. I didn’t get into this to become a children’s book author. I did it to have the book that I wanted for my child. It turns out it was useful to others as well. But with it’s success, I didn’t want to just write another book just to do it. As I said earlier, I didn’t want to do a counting version of A is for Activist and then a colors version and then a shapes version. So I always said that if the right idea came up, I would do it. But otherwise, maybe nothing. When that idea did hit—the double meaning of the word “counting”—that was the book. 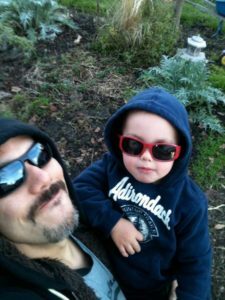 My son is now 5 and is into picture books and chapter books. I hadn’t thought of myself as much of a storyteller so I had been trying to find someone to partner with who had the right story that I could illustrate. But through a series of unusual events, my publisher became aware of a story that I have told about an incident in my childhood in Indonesia. My father is a dissident playwrite, and the story is set in Indonesia in 1978. It is a story about colonialism, power, and art for social change. The title is My Night in the Planetarium but more on that one in 2016. 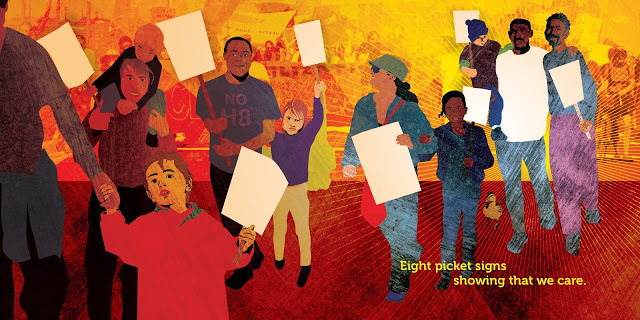 What are some of your favorite children’s books about activism? Despite my own book, I don’t necessarily think a book has to be explicitly about activism to be about the core of what activism is, which is agency. That being said, my current favorite book about activism is Joelito’s Big Decision by Ann Berlak and illustrated by Daniel Camacho. Full disclosure, I got to see an early version of it, and was so excited about it I ended up helping with the cover design. But that’s not why it’s a favorite. I love it because it is a story that is both explicitly about a particular action, but also about fairness, and a child’s choices. I’m also really excited about another book by an Oakland team, I am Sausal Creek by Melissa Reyes and Robert Trujillo. This one is told from the perspective of a creek that flows through Oakland, but it is also about the history of the land and it’s people, colonization, the environment, and ultimately, through resilience, what one can do. Also in regular rotation at bedtime for us is We March by Shane Evans. It’s a wonderful approach to introducing the fight for racial justice from the perspective of a child whose family prepares to join the March on Washington. What I love about it the most is the conversations that it has started in our home. Why were they marching? Who is that person? What is a leader? Another beautifully layered story that leads to conversations, rather than attempts to conclude them. There are so many others, but that would turn into it’s own article, so I’ll stop there. Thank you for the work you do! 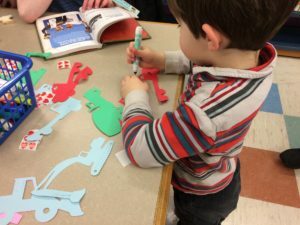 There is a movement afoot to push the children’s book genre out of the bland corporate monolithic industry that it has been, and this movement can only flourish when people like yourself put in the work to shine a light on it. 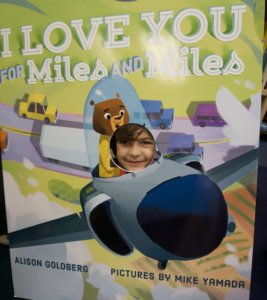 Farrar, Straus and Giroux is publishing my first picture book, I LOVE YOU FOR MILES AND MILES ! I’m so grateful to my fabulous agent Kathleen Rushall, and thrilled to be working with such an incredible and talented team!